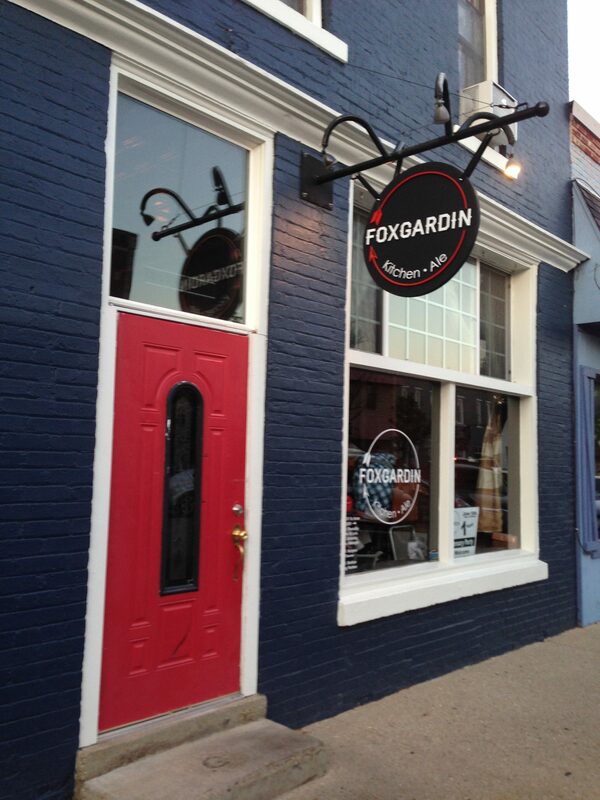 My instinct to search out new and interesting places to dine took me to FoxGardin – Kitchen and Ale in Fortville Indiana. My husband and I had an evening without children and felt like an excursion but I didn’t want to go too far. 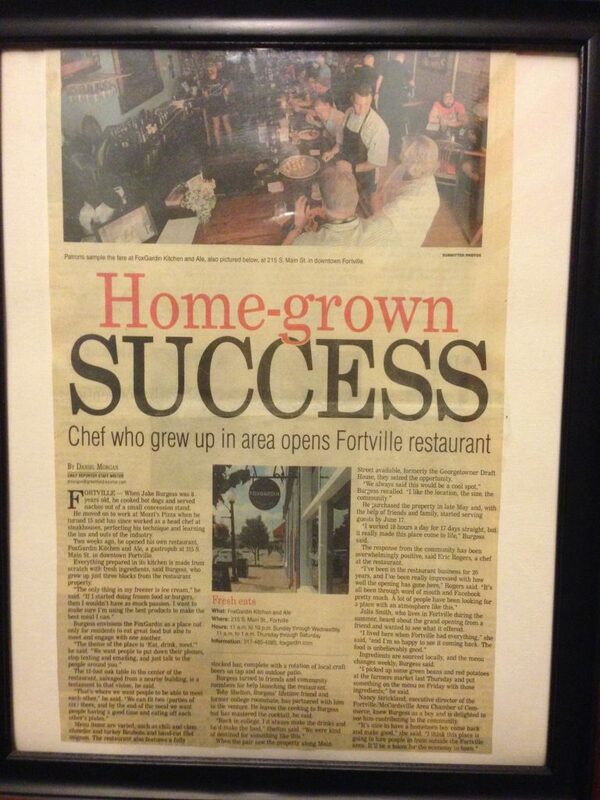 Fortville is a much better drive than Indianapolis from where we live. I’d read about FoxGardin in Indianapolis Monthly and suggested it to my husband. (There is a similar place in Perkinsville Indiana that we like but at 7:00 p.m. on a Saturday night we knew that wasn’t an option.) If you look through my other posts you will find this was listed as number 15 out of 25 top places to dine in the magazine. I have never been here but I knew the address was on Main Street and I figured it wasn’t that big of a town that we couldn’t find it. The downtown itself is very quaint and for me had a nostalgic feeling. Most small towns are probably are like that. I stopped into a little refurbished furniture shop before we moved on to the restaurant. There are several stores along the main street such as a coffee shop, bakery and salon. If you were looking for something to do on a lazy afternoon I think you could do it here. There was a live band set up at the end of street on this evening. We entered the small door stoop and put our name in for a reservation. At 7:00 p.m. there was a 15-20 minute wait for first available. I don’t think that’s too bad on a Saturday evening. You can make reservations on the website. The hostess offered that we could wait in the lounge if we wanted. There is a sign leading us up the stairs…so off we go. At the top of the stairs and around the corner to the right is the lounge located on the second floor. 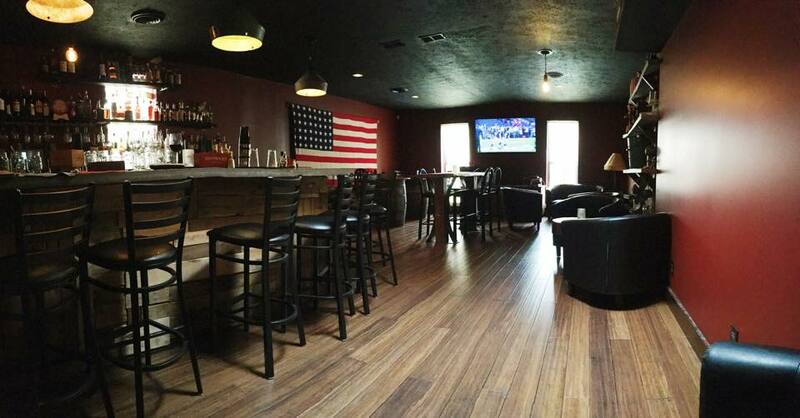 There were comfortable chairs, a bar and a few small tables. The waitress upstairs pointed out two chairs by the front windows and we took a seat. Now, this is a rustic place with lots of antiques and wood décor. I personally don’t mind this style. I think it gives the place charm and from what I’ve seen this is the theme throughout. Next to us was a freestanding wooden turn table (record player) and a stack of records. 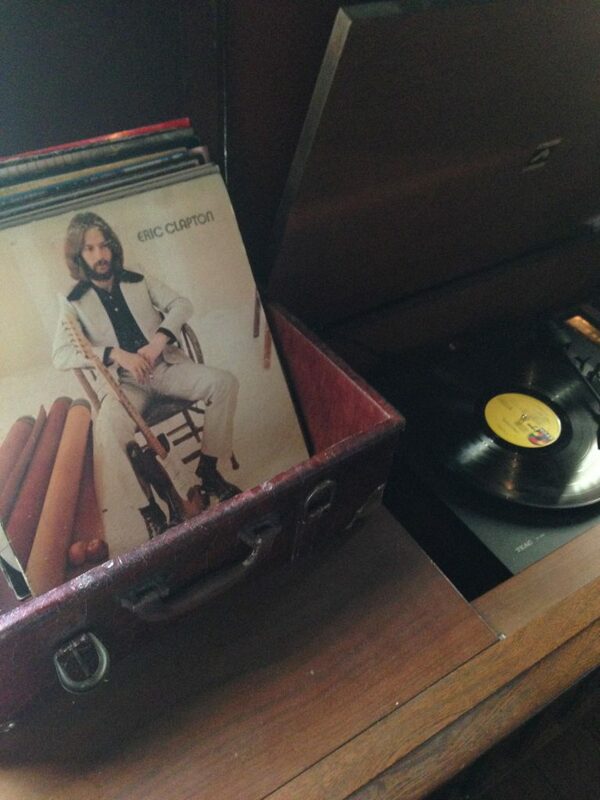 Eric Clapton was playing and apparently you can play any records from the stack or bring your own! When the waitress came over to get our drink order she greeted us like she was welcoming us to a party and not just taking our order, “Hi! I’m Brittney what can I get for you?” she said while holding out her hand to shake ours. I guess you had to be there. I looked over the wine list and beer options but decided to break out of my norm and go for a cocktail. We struck up a conversation with the young couple next to us and I ordered a Main Street Manhattan. Very tasty! And just that quickly we were seated. I think it was 10 minutes. Back downstairs to the bar we went. We had the end seats which put us very close the live music. There was a gentlemen playing guitar by the front window and singing old classics such as Beatles and Beach Boys tunes. They have various performers on a regular basis. 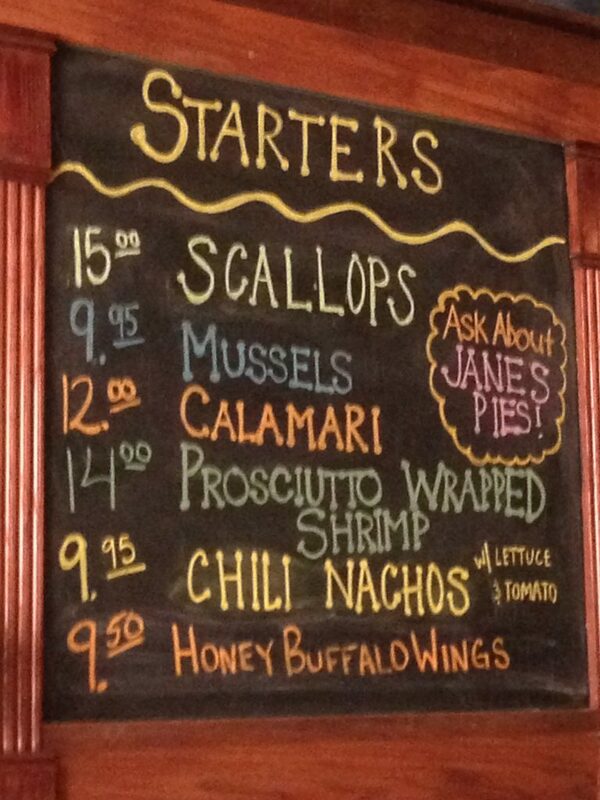 Starter Menu…. It was a difficult decision. I glanced over the menu while we were upstairs in the lounge and had decided on the Sea Bass. But when our bartender/server Phil told us the specials I changed my mind. 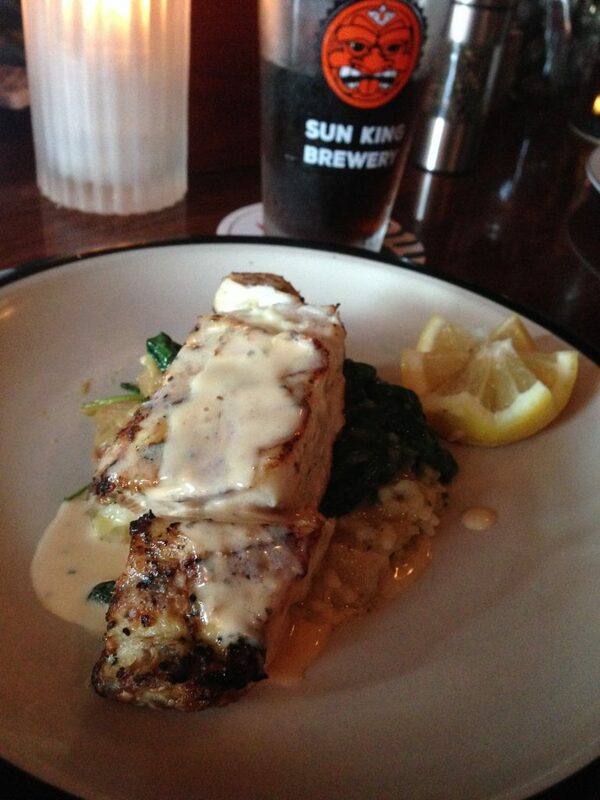 The seafood special was grilled Corvina* which is similar to Sea Bass with a meatier texture. The manager, Zach Barnes, came by and explained that the flavor profile of the Corvina can stand alone where Sea Bass tends to take on the flavor of the sauce it’s prepared in. He said the first time they put Corvina on the menu it sold out in 2 hours. I was sold and while I was imagining how my dinner was going to taste… I was too distracted hear the steak special he was describing. I think it was a Ribeye.. which is one of my favorite cuts of meat. 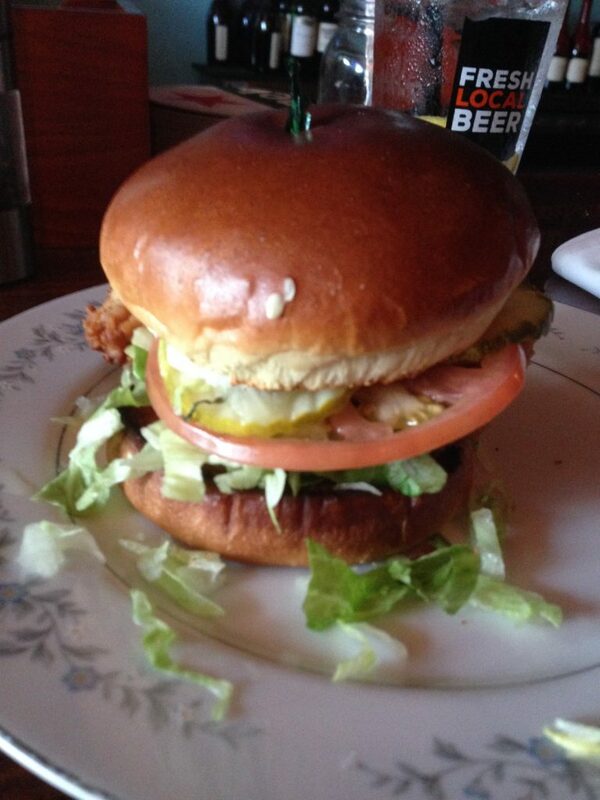 My husband ordered the Fortville Tenderloin Sandwich. Indiana is a hub for these sandwiches. 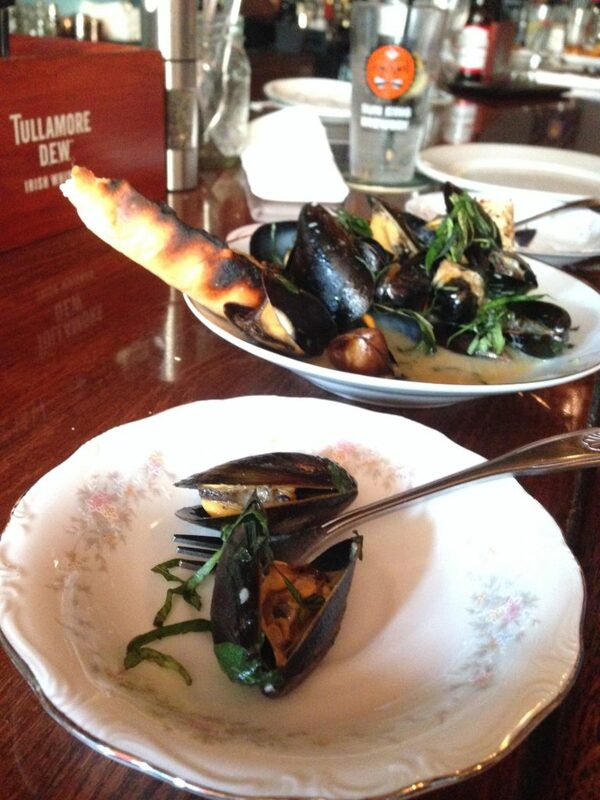 The menu changes periodically based on what’s in season. While we waited on the main course I soaked up our environment filled with things like old radios, wooden wall phones and tin ceilings. I asked the hostess about the tin ceiling and she believed they were original. One of the owners/Chef Jacob Burgess was checking on customers and I was able to get a quick interview with him about the restaurant. Jacob was formerly at Prime 47 before starting this venture with his partner Toby Shelton. These two met in college when they were at Ball State University as roommates. Jacob’s initial major was Food Hospitality but eventually decided he wanted to work in the kitchen. He was a server at a popular Muncie restaurant Vera Mae’s. He said he wasn’t very good at it. One evening after he had been serving a former President of Ball State dinner … the owners of the restuarant asked if he “still wanted to work in the back.” He said “yes” that the rest is culinary history. Jacob and Toby came up with the name FoxGardin by combining their mother’s maiden names. Jacobs mother Jane makes the pies daily. On the day we visited FoxGardin she had just made 22 pies. When Jacob asked her to do this since was busy with other duties. 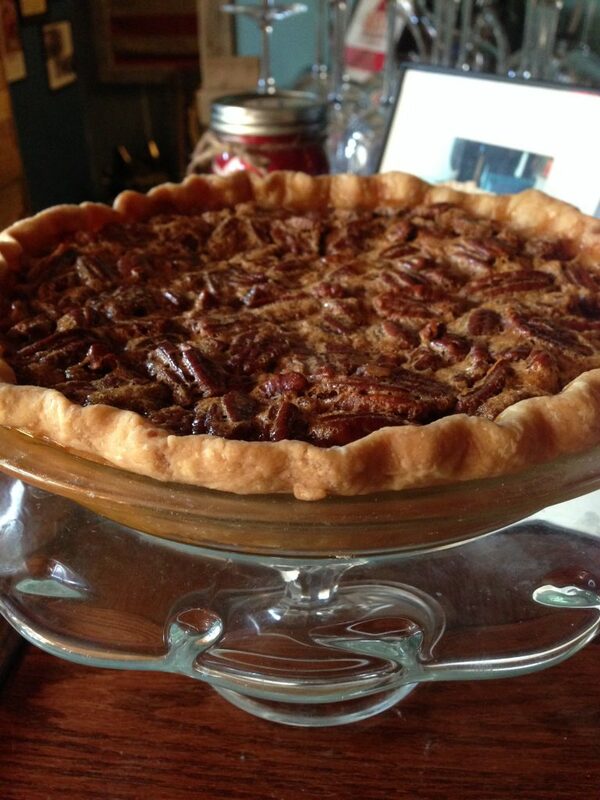 She commented, “No one is going to want to eat my pies.” Since then she’s made approximately 1300 pies in the last 11 months. 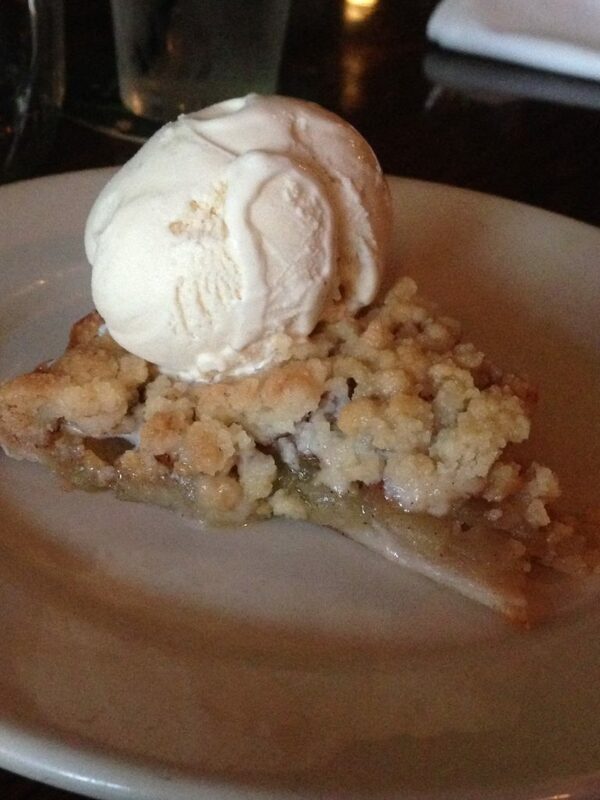 Jane’s Apple Crumb Pie ala mode..
Jacob told us he got a lot of the décor from his father who was an auctioneer. You can’t help but feel as though this is a family (and friends) run establishment. They try to use local sourced food and labor. The carpenter that completed the new outside deck and roof dining is local. (FYI- Had I known about the roof top dining I might have requested that) They really have maximized their space. 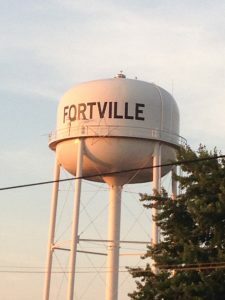 View of Fortville water tank from roof deck. 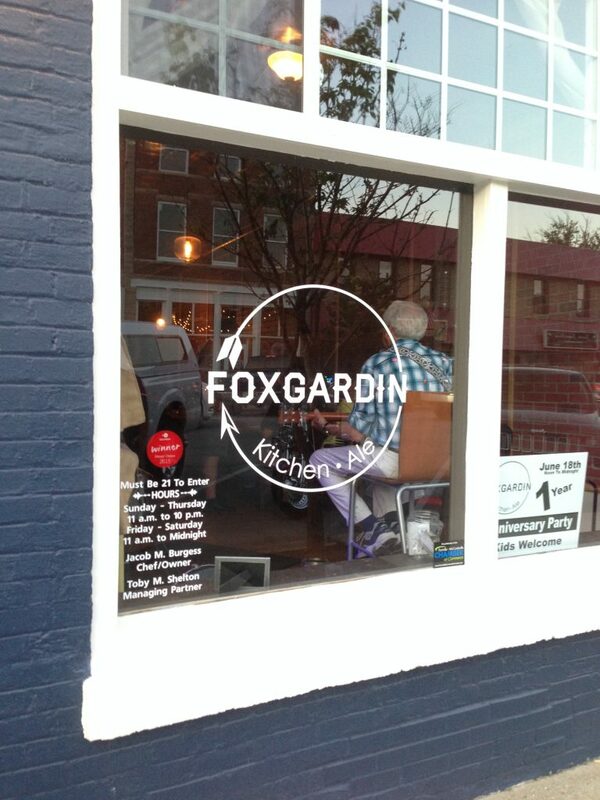 FoxGardin Kitchen and Ale has a facebook page, twitter account and website. Check them out! *Corvina has a mild, sweet taste with firm, large flaked flesh which is pinkish when raw but cooks up white. The flesh resembles Snapper. In South America Corvina is regarded as a prime table fish and is very popular for ceviche.